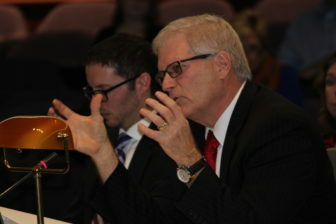 CSCU President Gregory Gray takes questions from legislators. Top state legislators are concerned about how much officials of the state’s largest public college system are spending on administrative costs. 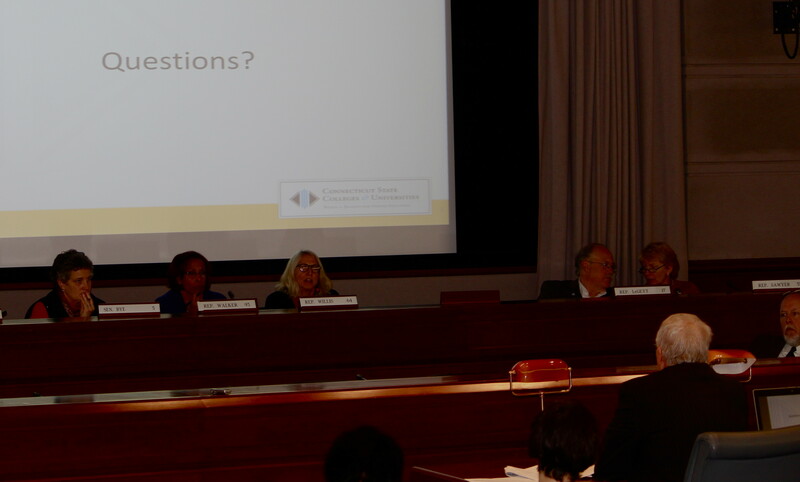 Leaders of the two committees overseeing the 90,000-student Connecticut State Colleges & Universities are questioning $2.7 million in recent expenses. Those costs include nearly $2 million for private consultants hired to come up with a plan to improve the system; a nearly $70,000 severance package to the system’s second-highest official; and $680,000 for marketing, software and staff to administer a program aimed at boosting enrollment. “Really, $1.8 million? 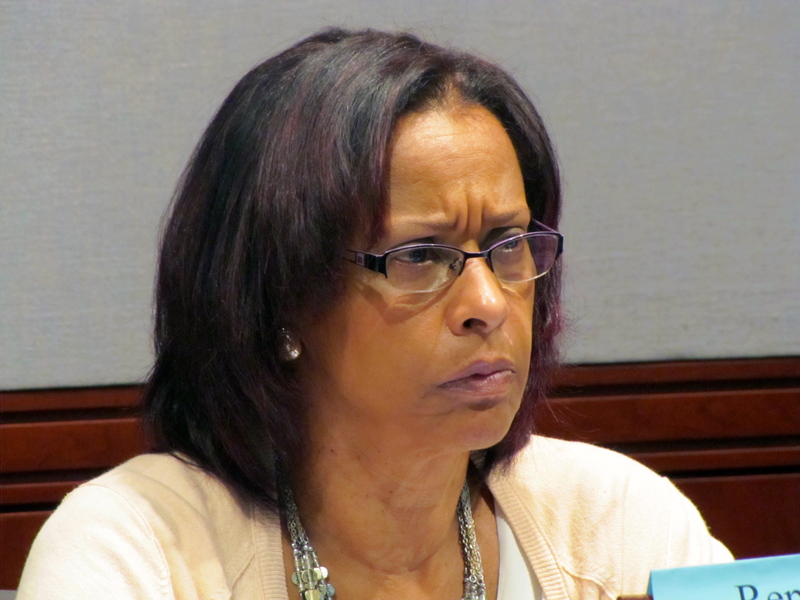 Please, I would not be doing my job if I did not scream about that,” state Rep. Toni Walker, D-New Haven, House chair of the Appropriations Committee, said of the consulting contract after a two-hour meeting with college officials last week. The CSCU system includes the four regional Connecticut State Universities, 12 community colleges and the online Charter Oak State College. That backlash captured the attention of state legislators, and several questioned Gray during the meeting at the state Capitol complex about the consultants’ work. Gray said the $1.97 million contract with the Boston Consulting Group was necessary to create a strategic plan for the schools. The college system agreed to pay three consultants an average of $426 an hour to create the strategic plan and find efficiencies. It’s not unusual for a college system to hire a consultant to identify areas to improve and create efficiencies – the University of Connecticut, the state’s separate flagship university, spent $3.9 million in 2010 to find savings as the system grappled with closing a deficit. But those expenses are a concern to Rep. Roberta Willis, co-chair of the Higher Education Committee. Last month, shortly after meeting with the college system’s provost, Gray picked up the phone and called Willis and members of his governing board. The message was clear, three recipients of the call told The Mirror: the president had just terminated Michael Gargano, the provost he had hired seven months earlier. “I distinctly remember him using the term terminate,” Lawrence J. DeNardis, a member of CSCU’s Board of Regents and a former congressman, told The Mirror during an interview. “I was not told he was resigning. I was left with the impression he was terminated,” said Willis. “There was no question, he was terminated,” Sarah E. Greco, the student member of the board, said of the phone call. In normal circumstances, the departure of a college system’s second highest-ranking official wouldn’t draw a backlash. But many faculty said Gargano was their advocate, and were upset with the murky circumstances under which he left his post. And then came news that Gargano would be getting paid through February, and that his separation agreement would restrict him, or anyone in the college system, from speaking about what happened. That didn’t sit well with prominent legislators. “If there is continued payment from taxpayer dollars, then there should be transparency, because we need to understand what exactly the foundation is for spending that,” said Walker. And then there’s the law, said Willis. “If someone is a public employee, we should know the conditions. The statute says that,” said Willis. Regardless of what went wrong in this situation, an attorney who represents officials in higher education and specializes in contracts and compensation, said keeping the circumstances of departures private is in schools’ best interest. Separation agreements “are designed to protect both parties,” said Raymond D. Cotton, a partner with Mintz Levin law firm in Washington, D.C., who has represented officials at more than 350 institutions. Greco, a student Regent, said she agrees that the provost deserves a separation agreement after being terminated. “He’s due a severance package,” she said during an interview. DeNardis, former longtime president of the University of New Haven and now a regent for the public institutions, said he is not questioning the president’s authority to choose his provost, but he has questions about the severance payment. “I need to know a lot more about why. It’s been shielded from us. I don’t know the full story,” he said when contacted by the Mirror. Separation agreements are common in higher education, said Cotton. UConn’s budget chief earlier this year left with a $138,000 separation package and agreed not to make any “derogatory or defamatory statements” about the school. “Bottom line: I don’t know what we’re paying for,” said Roberta Willis, House chair of the Higher Education Committee. Both of the state’s public college systems were unable last week to provide the Mirror with any separation agreements signed by school officials since 2011. Earlier this year, state lawmakers gave the CSCU system $6 million to roll out a program to lure back students who left school without graduating by offering three free courses. Legislators were surprised to find out last week that half of the $1.36 million spent so far has gone to administrative costs; including for marketing, staff to oversee the program and a new data system to track the progress of these students. “That is not what we wanted,” Walker told college leaders. Pressed by legislators about how much of the non-classroom costs would be recurring, leaders were not able to provide specifics. Of the $2.7 million the school has committed to spending in the future, an official said, that would “mostly” go toward providing the free courses, but there would be continuing administrative costs. If all of the remaining “commitments” go to the classroom, the system will have spent 16 percent of the $4.1 million on administrative costs to enroll 967 students. Erika Steiner, the system’s budget chief, said the computer software licensed by the schools to track students will be used for several other useful things. The enrollment program — dubbed “Go Back to Get Ahead” — was aimed at enrolling more students, in part to ease the system’s financial troubles since students would be paying tuition for courses beyond the three free ones. Willis wants to know if the state has received that return on its investment. “I don’t think I got a clear answer on that,” she said. The costs going to administer the program were “a little disconcerting,” she said. When the community college system was merged with the Connecticut State Universities three-and-a-half years ago, it was pitched as a way to reduce administrative costs and direct more money to the classroom. Since then, it has been hard to break down the central office’s administrative costs. The system’s most recent adopted budget has 64 full-time employees working at the central office, which has a budget of about $15 million. The U.S. Department of Education requires every institution that accepts financial aid to report information to its Integrated Postsecondary Education Data System. That information includes the functions of full-time employees; such as instruction, research, management, healthcare and administrative support. Central governing offices that oversee numerous schools but don’t enroll students themselves, like CSCU’s central office, are not required to submit their data. Officials of the public colleges used to submit their budgets to the Department of Higher Education’s Board of Governors to review and make recommendations. That department and board no longer exist. State lawmakers last year passed a law requiring the regents to report biennially the system’s faculty-to-administor ratios and to list salaries of administrators and how they compare to peer institutions. Legislators are still waiting for the first report, which was due more than 11 months ago.